Reliably removes generated static charges. Additionally, silver fibers are antibacterial to help keep the band and operator clean. Only one item to stock; may be fitted to almost all people. Providing lot traceability to ensure quality control. 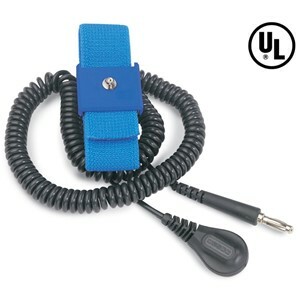 Twelve Foot Working Radius (18 Inches Of Nonextended Coils) Coil Cord Allows operator to move freely within work area.